Product prices and availability are accurate as of 2019-04-19 06:32:28 UTC and are subject to change. Any price and availability information displayed on http://www.amazon.com/ at the time of purchase will apply to the purchase of this product. Connect with your witchy self each and every day using quick, easy, and fun practices. 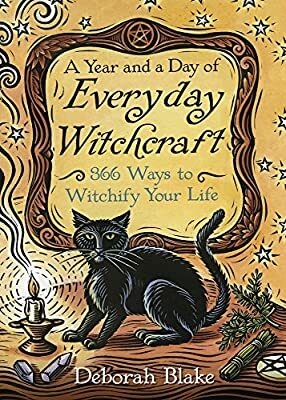 This handy book features simple yet meaningful ways to integrate witchcraft into your daily life, inspiring you to take your magic to a new level whether you're a beginner or an experienced practitioner. Deborah Blake guides you on a journey through the Wheel of the Year, providing witchy wisdom, affirmations, spells, questions to ponder, and much more. From working with herbs and gemstones to connecting with deities, A Year and a Day of Everyday Witchcraft explores a variety of modern Pagan practices to help you get more in touch with your personal path of witchcraft.